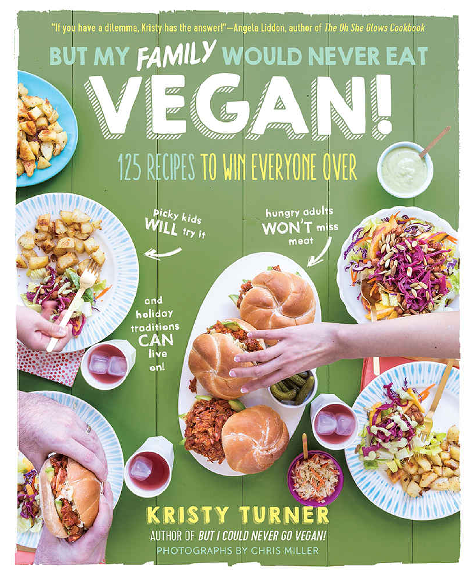 Cookbook of the Month: But My Family Would Never Eat Vegan! You’re in for an end of summer treat: Dr HH is here to review But My Family Would Never Eat Vegan! Who doesn’t like tofu for breakfast? 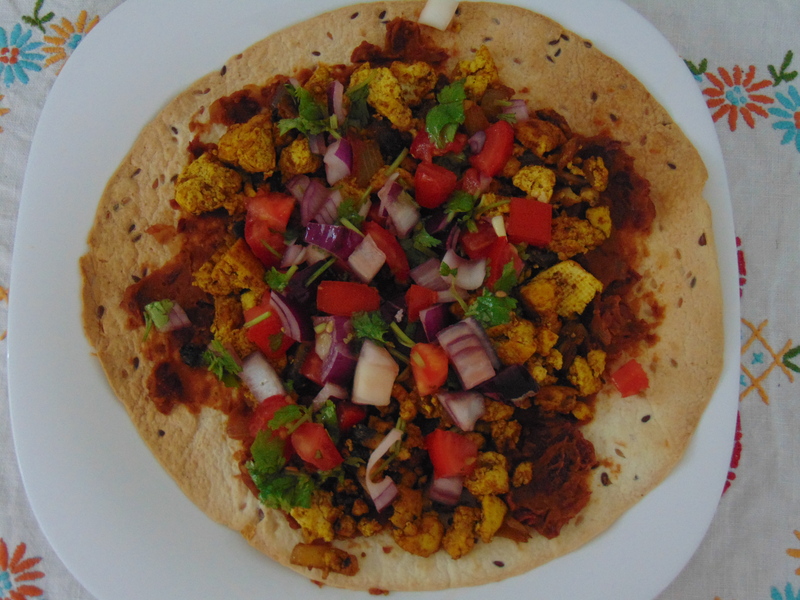 Regular readers know that I am the king of the breakfast tofu scramble, but I’m always willing to try out other recipes. The tofu rancheros consisted of a tortilla that had been baked to crispiness, spread with a layer of 15-minute refried beans, a generous scoop of tofu scramble was added before being topped of with my own pico de gallo (there are various toppings suggested in the book so go wild and top it however you see fit). The beans were easy to make and added a nice spicy flavour to things. The tofu was a good egg imitation with the use of turmeric and sulphurous black salt. All in all, this was a great take on breakfast tofu, with the beans making it rather different to most others. Ms HH was in charge for the maple-peanut butter pancakes. 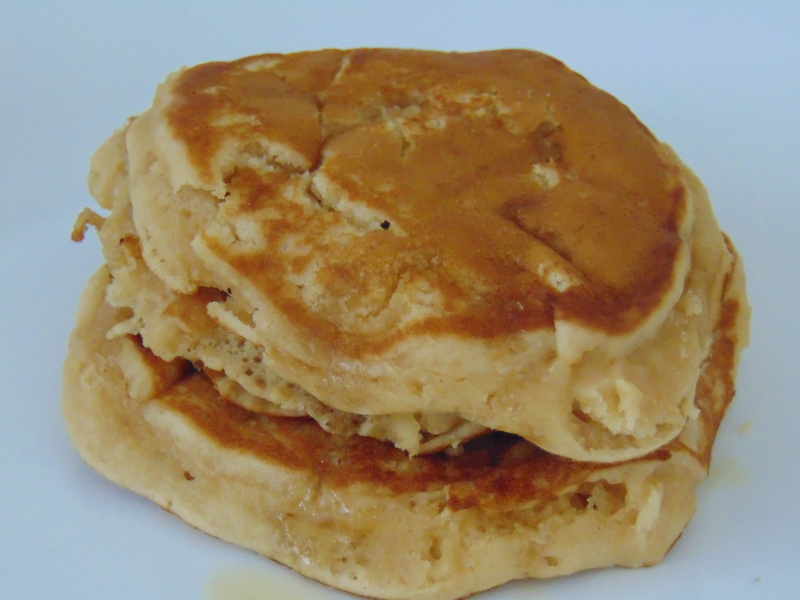 This was a good simple and easy to follow recipe that produced thick pancakes that were perhaps a little too sweet. I had been eyeing up the savoury breakfast casserole from the first time I cracked this book open. This dish required a bit of forward preparation on my part. I realised that roasting little chunks of potato (we don’t know where to buy ready-made hash browns here), making tempeh bacon crumbles and making the thick omelette-eseque batter all at the same time may have been a bit ambitious. I dealt with the potatoes and bacon the night before and cracked on with the batter the next morning. This casserole was fantastic, it was like a giant omelette tray bake filled with lots of tasty little bits and pieces. I didn’t crisp the potatoes too much when baking them so they got a little lost in the casserole, I definitely recommend getting them good and crispy on the outside before throwing them in. 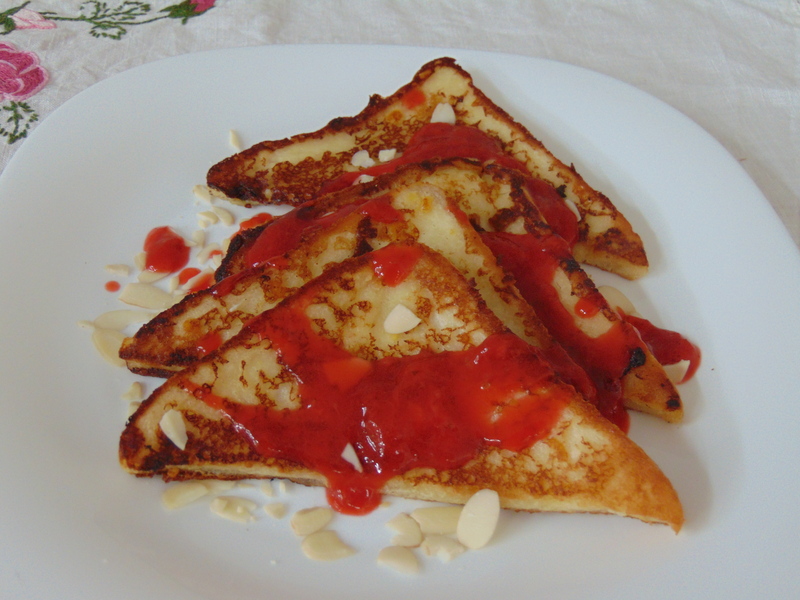 One of the last recipes I took on from this book was the daunting sounding vanilla French toast This was my ever first attempt at French toast and I imagined a laborious and fiddly process that might just be too much for me. I overcame my fears to tackle it and I can declare it a success! The strawberry sauce had a nice hint of citrus which was a good complement to the sweetness of the dish. By the end, I had come to the conclusion that French toast was far easier to make than pancakes. 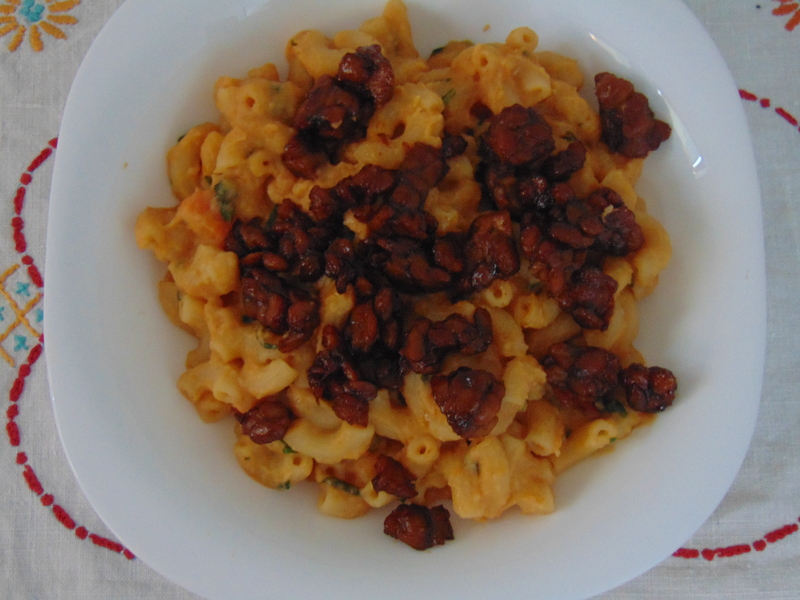 I’ve eaten my way through quite a few mac’n’cheese recipes over the last year or so and have to say the hidden veggie mac’n’cheese sits pretty low on the list. Maybe I didn’t get my vegetable ratio quite right so it all tasted a bit sweet. On the second helping I livened it up with a scattering of tempeh bacon crumbles (an idea taken from her first book) on top and that was a fine addition. 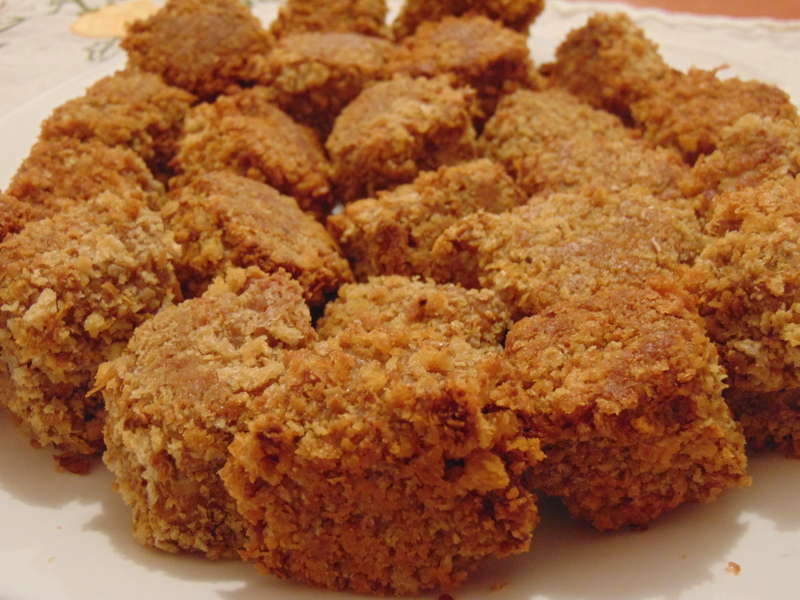 The tempeh nuggets were another thing that caught my eye early on but ended up being the last thing I made this month, I just got it made and written about in time to make Ms HH’s strict publishing deadline. The nuggets were lovely and tender on the inside with a lovely crunchy outer. The tahini coating gave them a really good savoury flavour and they were excellent with the blue cheese dip. 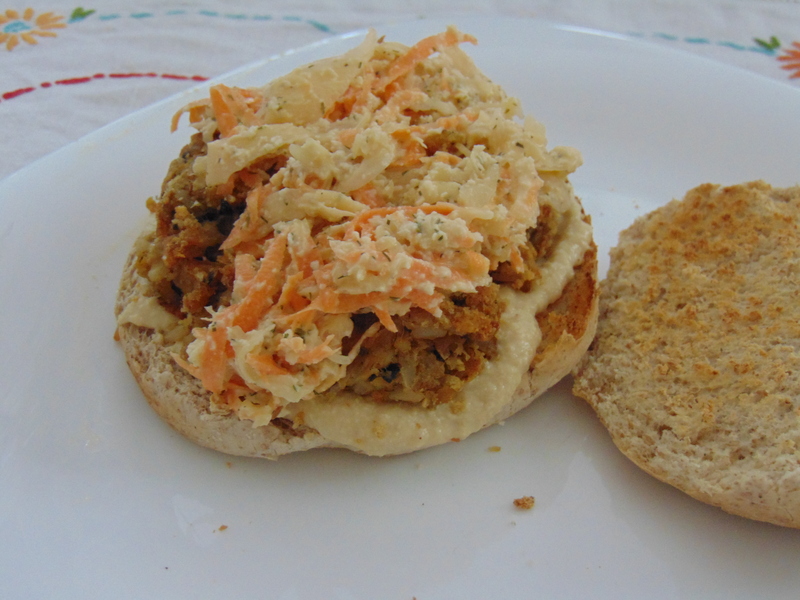 We had already had quite a bready day when I decided to make the tempeh sloppy Joe sliders so I served it with rice and topped with avocado rather than as a sandwich. 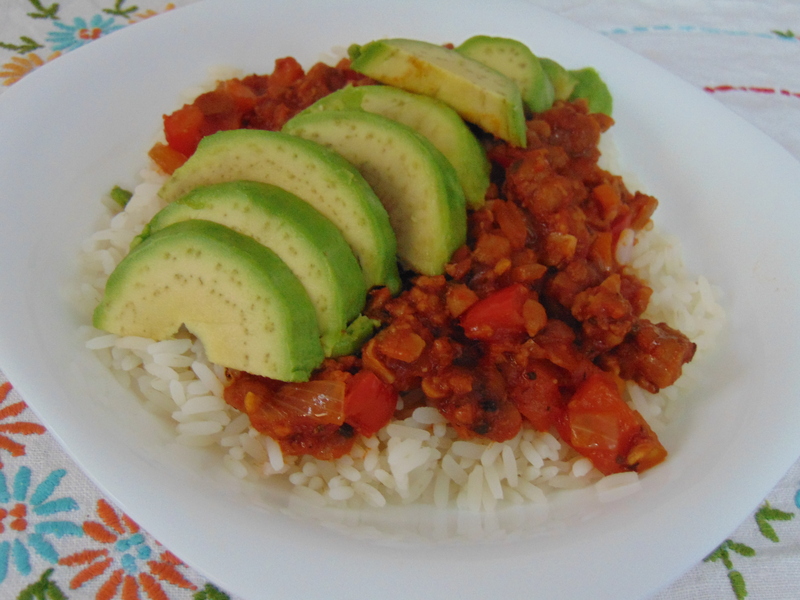 This was the first time I’d made a chilli using tempeh as my meat and I am amazed that I had never had this idea before, it was lovely and meaty with great flavour. There was no actual chilli in the recipe and I decided to stick to that and just scattered some chilli flakes on my own portion. The cheese-stuffed meatballs made for an incredible meal. 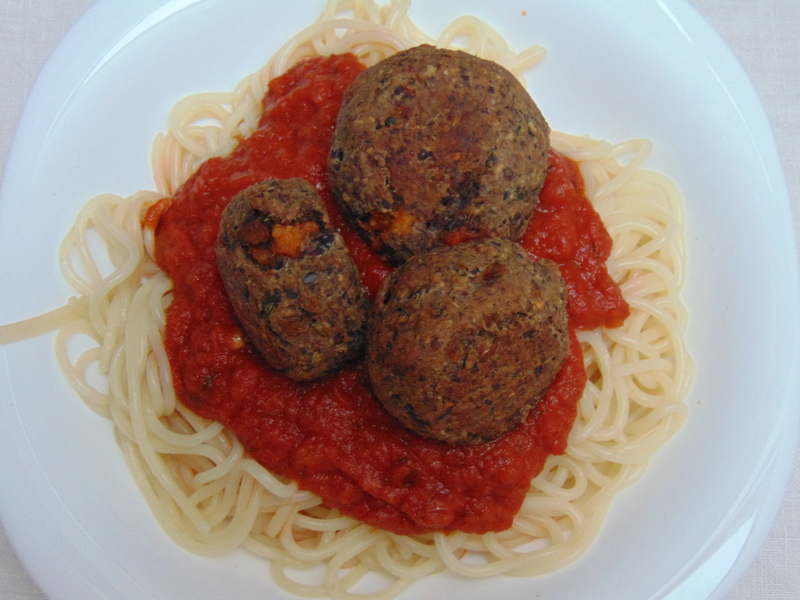 Mushroom meatballs filled with a gooey smoked gouda cheese sauce, served with a wonderful rich and flavour packed sun-dried tomato marinara sauce and spaghetti. This dish was my first dabble with the cheese sauces in this book, the sauce was tasty and easy to make. Overall, this dish took some time to put together but the moment I cut into one of the meatballs and the cheese oozed out, I knew it was worth it. I do enjoy a good faux fish (fauxsh?) dish. I often go for something fishy when go to Asian restaurants and it’s always hard to resist prawns when they’re on offer. The fillet o’ chickpea sandwich with tartar sauce slaw was my first attempt at making my own mock fish and I declare it a success! This combination of chickpeas, artichokes and nori (the recipe called for kelp granules?!?) produced a convincing taste of the sea. The cheese sauce and tartar slaw were tasty accompaniments to go along with it but did lead to a messy lunch. As with any patty I’ve ever tried to make, i couldn’t get them to hold together very well, so I decided to bake them rather than fry. 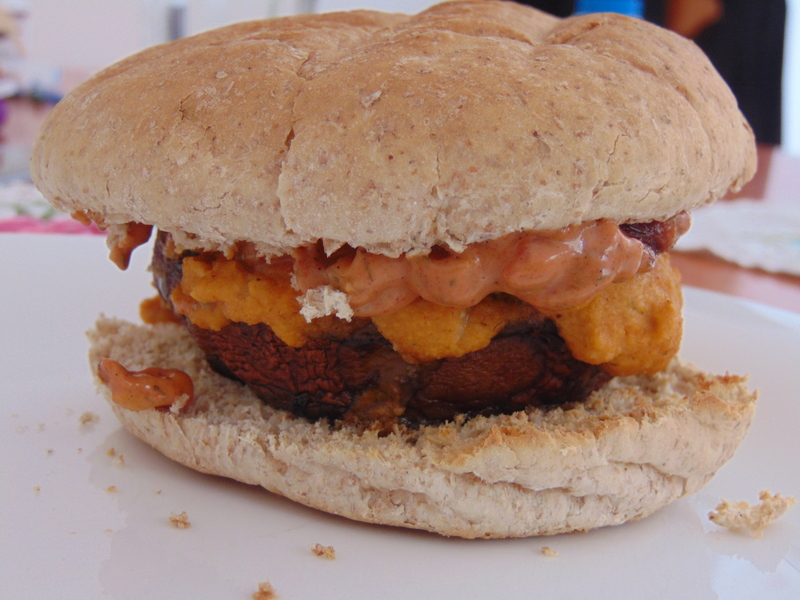 This did result in some exposed bits of rice in the patty becoming a bit too hard. The portobello Philly Reuben turned out to be more Philly cheese steak and less Reuben. A baked mushroom seasoned with soy sauce and filled with cheese sauce was obviously great. I have no real idea what Russian dressing is supposed to be like so I had a go at making some but found it a little too sweet for my liking. The sandwich was also supposed to be topped with sauerkraut but I played it safe and didn’t add any. 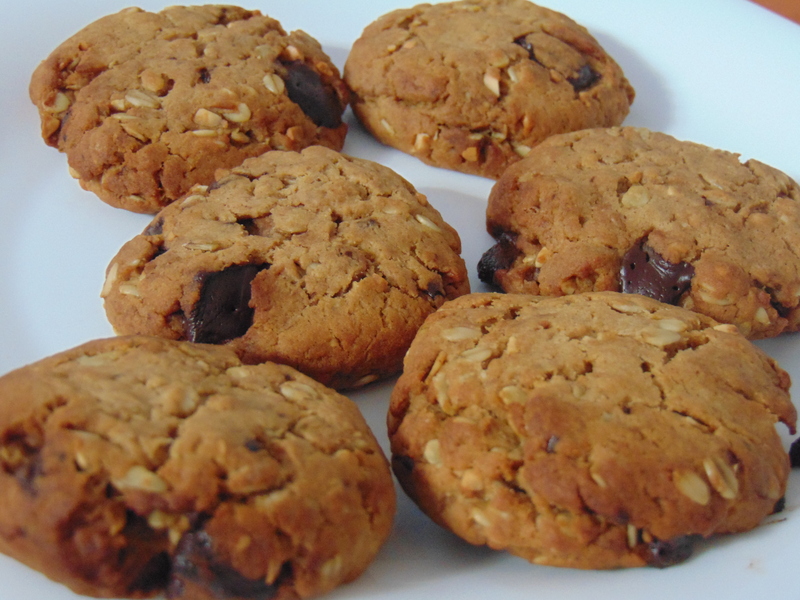 The peanut butter oatmeal cookies recipe says you can make 30 cookies, each using a generous tablespoon mixture. I managed to make 12, perhaps my tablespoons were a little too generous. The cookies were excellent, good and crisp on the outside and soft on the inside. The nutmeg and cinnamon spicing gave them a nice warmth and I added in some chocolate chunks because all cookies are better with chocolate. 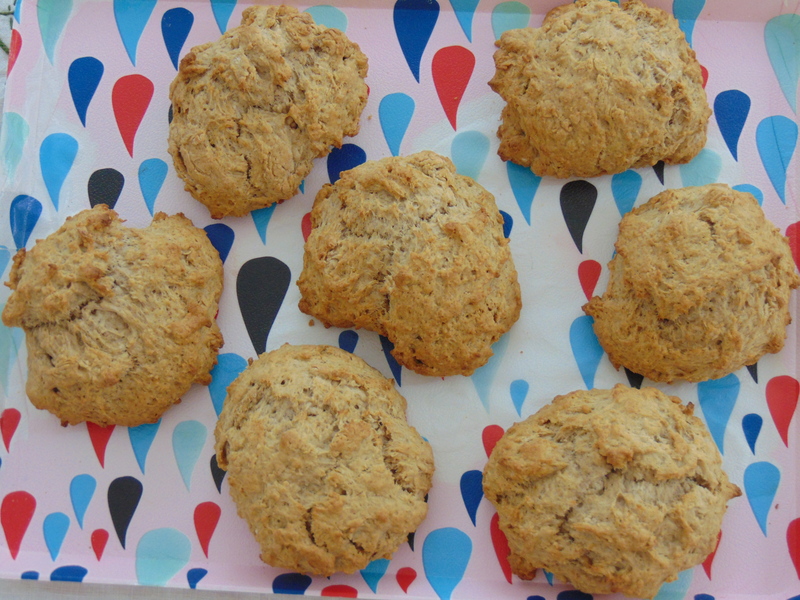 Ms HH was back in the kitchen for some baking and whipped up a batch of pumpkin chai scones. 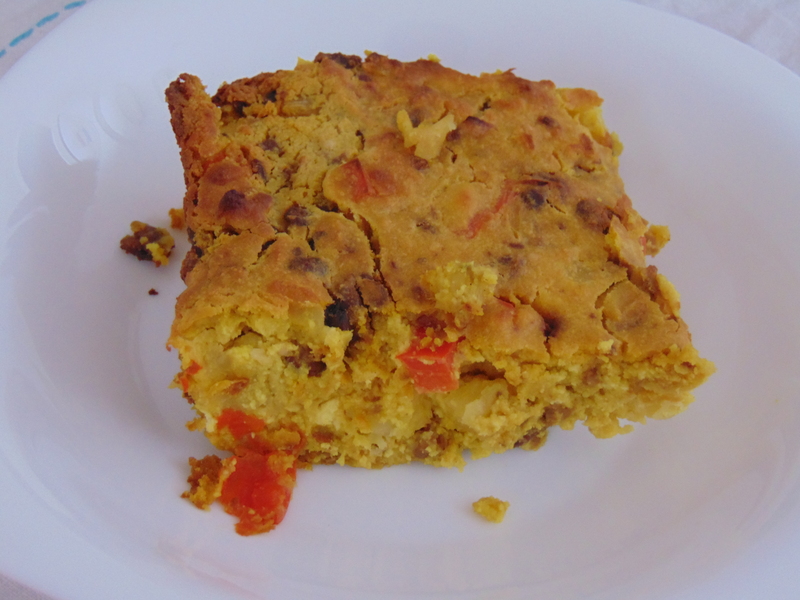 These were actually apple flavoured as she used applesauce instead of pumpkin puree and it led to a bit of a sloppy dough. This was remedied with the addition of lots more flour and we ended up with a tasty tray of Christmas flavoured scones. I was never a fan of cauliflower growing up and I’m glad I have learned to love this versatile vegetable. 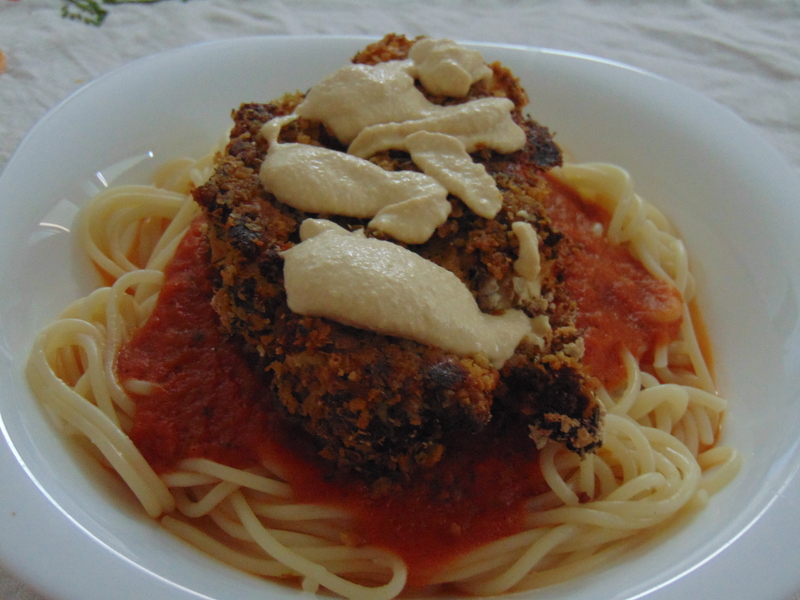 The cauliflower parmigiana consisted of giant cauliflower steaks covered in a great breadcrumb mixture (nooch makes everything better) and baked to tender perfection. It got a bit messy and lots of my cauliflower fell to pieces as I tried to cut it, but unsurprisingly little florets coated in breadcrumbs and baked were just as good. This was served up with spaghetti, sun-dried tomato marinara sauce and basic cashew cheese sauce for a hearty plate of food. 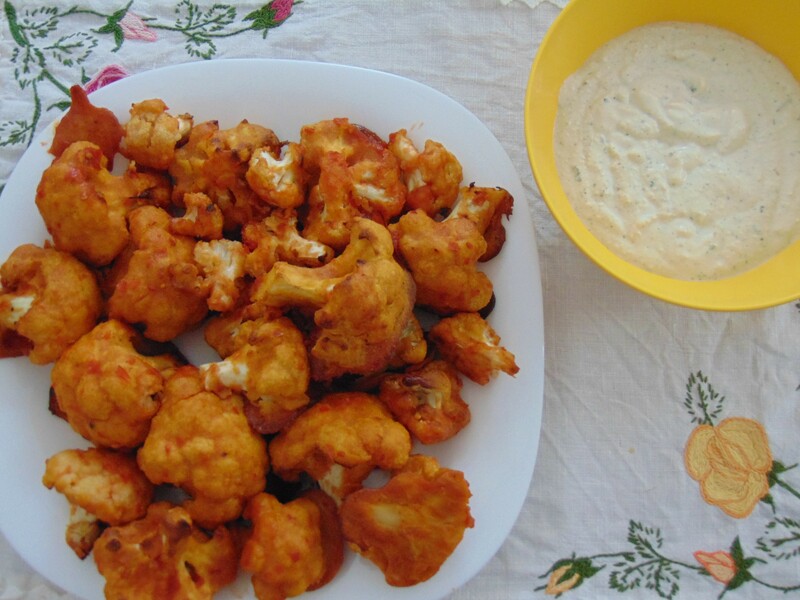 I was keen to try the buffalo cauliflower wings with blue cheese dip as I had made some cauliflower wings in the past which were a little hit and miss and wanted to try a different recipe. I got a good thick coating on the cauliflower and the hot sauce gave a good punch, though I halved the amount of hot sauce that went into the mix to make sure it wasn’t too spicy for a certain spice lightweight who shall remain anonymous. Ideally, I needed to be more patient and bake them for longer to crisp them up but I was hungry. The blue cheese dip was fantastic. Creamy and rich with a little tang, I thought it was an excellent approximation of blue cheese. How do I thank my family for welcoming my vegan diet? 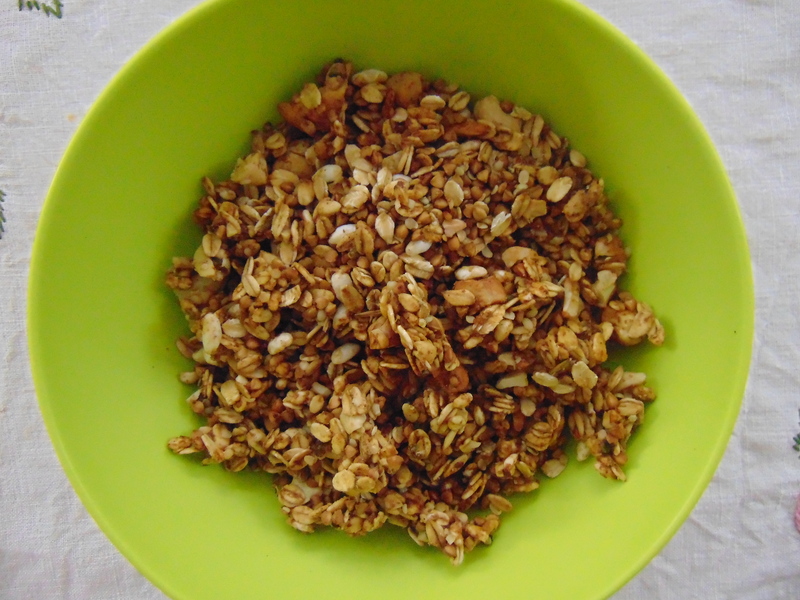 After getting a taste for making granola over the last year I was happy to give the caramel cashew granola a whirl. It was fairly easy to make, but watch out for the 40 minutes of recommended baking time – I went for about 20 and that was plenty. There was a really enjoyable caramel flavour and lots of nuts for a good crunch. The buckwheat groats were very hard though and made it perilous for the teeth, maybe I needed to soak them first and soften them up a bit. That is everything! I thoroughly enjoyed cooking from this book, the recipes were pretty easy to follow and everything tasted great. 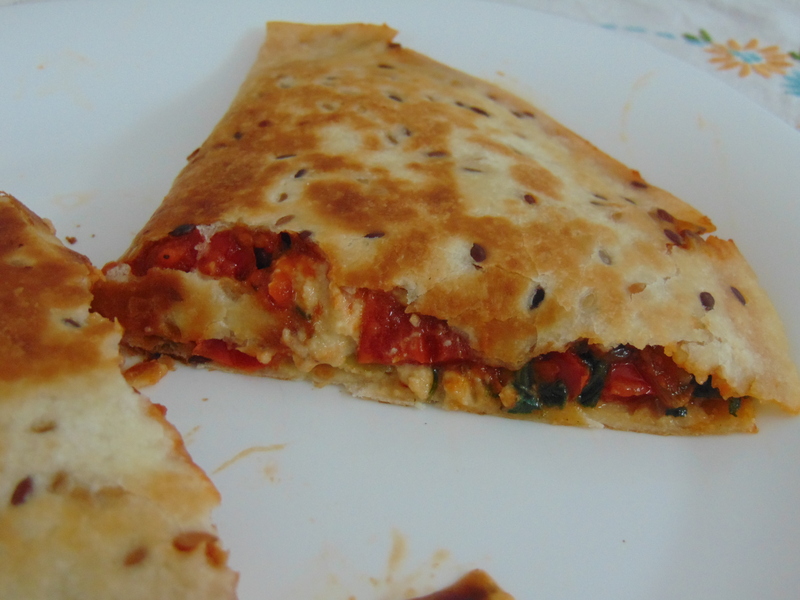 The cheese sauces were incredible and so easy to make, and I can’t believe I had never thought to use sun-dried tomatoes in my tomato sauces for a richer flavour. The book rather helpfully has measurements in both cups and grams and occasionally even in ounces and pounds. Just like the first book, this is a huge tome with so many recipes that I would have loved to make if I had had more time. This entry was posted in Cookbooks and tagged But My Family Would Never Eat Vegan review, vegan cookbook, vegan cookbook review. Bookmark the permalink. 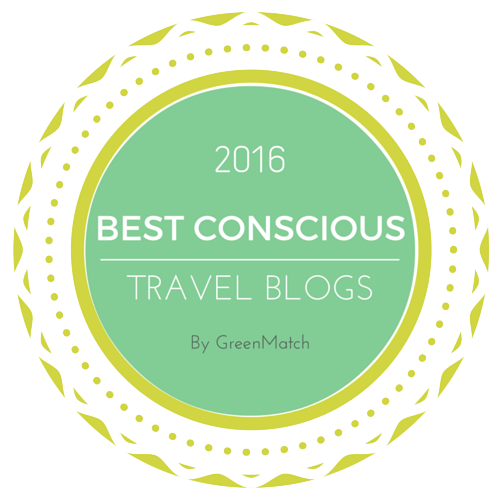 4 Responses to Cookbook of the Month: But My Family Would Never Eat Vegan! I’ve been wanting to get this cook book and it looks so tasty! I never got Kelp Granules but I think they might be an exclusive American thing? I see them sold like salt, to enhance a flavor but not have much sodium? I’ve always done the same thing. I definitely recommend the book! And I’m glad to hear that we improvised correctly with the kelp granules/nori substitution. I’m always fascinated by the different ingredients that come up in American cookbooks.